A while back I created a post featuring my very favorite items for newborns. These were a few things we couldn’t live without in that very early baby stage. But, as we all know, babies change and grow quite quickly. What may be essential at 3 months may not be needed at 6. So today I would like to share with you some of my favorite items for 6-12 month olds. These little sweeties are learning to sit up, crawl, pull up, eat, and walk. They’ve got a lot going on! Most of these items are ones that we used on nearly a daily basis during this precious baby stage before they take off running into toddler-hood. My girls absolutely loved their exersaucer. We had an adorable little Lion King exersaucer that they no longer make any more, but this one is pretty similar as far as the different noise making things that are on it, but this one is even better because it can be used several different ways! We started letting them sit in the exersaucer when they started being able to control their head and trunks better (I believe around 4 or 5 months) and they enjoyed sitting in it until well after they turned 1. I would sit them in it while I took a shower, made dinner, or clean and they were able to keep themselves entertained for a while. When Raley was about 3 months old, she started rolling from her back to front, so we had to find something to replace her swaddle. She wasn’t ready to go from being swaddled to nothing, so when we came across the Zipadee-Zip, we thought we’d give it a try and see how it worked. We absolutely loved it! It keeps their arms and legs from being too free + it keeps them warm. It’s a great transition from the swaddle. (We used it for Audrey as well and they both wore it until they were about a year old.) The creators of the Zipadee-Zip have a pretty cool story, so be sure to check them out! Once your baby starts eating baby food, you will want a good high chair. There are a few things you want to look for in a good high chair – that it’s not too bulky, the tray is not too small, and (personal preference) that it has a spot for a cup. 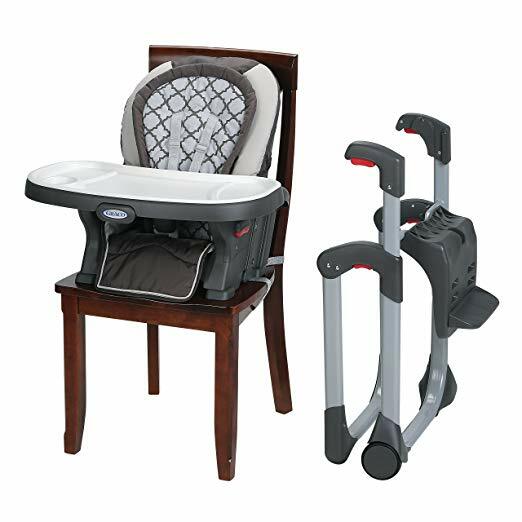 If I were picking out a high chair for my baby today, I would pick this Graco Duo-Diner Convertible High Chair. It has everything I mentioned above + the seat comes off and you can attach it to a chair as a booster if needed. Too cool! I wish I had known about this when my kids were babies! I got this folding booster seat as a gift for my niece’s first birthday. It’s perfect to take with you to the park for a picnic because babies don’t like to sit still if they are not contained in some way! Babies get very mobile and very curious at this stage so be sure to baby proof those stairs, or any other area that you don’t want them getting into. As far as baby gates go, I prefer the gates that you can open and walk through. Let’s face it – babies are messy! Once they start learning to eat baby food, get rid of those cute, soft little bibs they wore when they were newborns and find some cheap ones that you don’t care get ruined. This 8 pack of solid bibs are great for those messy little eaters. Unless you are a stay-at-home mom who is exclusively breastfeeding, you are going to need a good bottle until at least 12 months when they start drinking whole milk. My favorite are these Medela bottles. I only used Medela with Audrey because I honestly didn’t see a reason to try anything else. I started with Medela bottles because they fit on my pump, but they were also easy to clean, had convenient storage lids, + Audrey liked them, so why change? Babies typically start to teeth between 4-6 months and although there may be periods of relief between teeth, it seems like they are “teething” constantly until their 2 year molars come in! Ok, that may be a bit of an exaggeration, but if you already have kids, you know that teething is for the birds! These teethers are inexpensive and they are great for those sore gums and drooly mouths. Pop them in the freezer for a bit before handing it to baby and he will be on cloud 9! Speaking of teething, people swear by these amber teething necklaces. The amber in the necklace has anti-inflammatory and immune boosting properties, which are supposed to help with the swelling and soreness in their gums as they’re cutting teeth. We had one for our girls and I would recommend giving it a try! These snack cups are perfect for when baby starts to grab snacks on their own and begin to feed themselves. The soft lid allows them to stick their little hands in and grab the snacks on their own. I hope you found this list helpful, especially if you are looking for items for a baby registry! 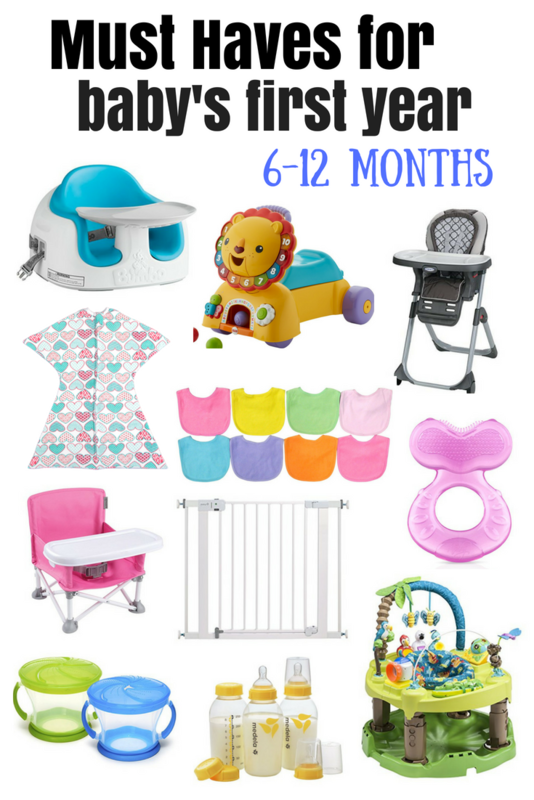 Go ahead and add these – six months flies by with a baby and you will be needing these things before you know it (some even before 6 months)! If you have children, what items did you find essential during this stage? Is there anything you would add to this list? *This post contains affiliate links. If something is ordered using one of the links provided I will receive a small percentage of the sale. All opinions are my own and I am not being paid to review these products. Okay, buying those snack cups! They look perfect for the car!